George was at it again in this year’s Budget. Of course, the Chancellor could have said “Duty on alcohol will increase by 2% above the rate of inflation, as put in place by the previous Government” but the news channels would have picked up on that bit of bad news. Anyway, here are some numbers and a few updated graphs. 1. The duty on still wine goes up on 26th March 2012 from £1.81 to £1.90 a bottle, plus VAT on the duty as well as the wine. 3. 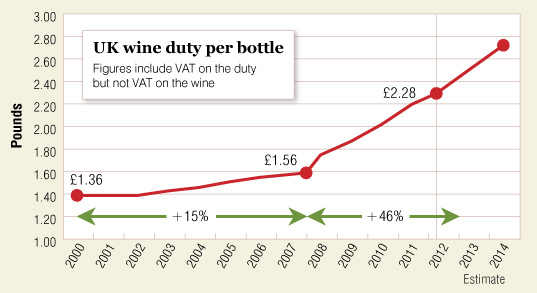 Before the March 2008 Budget, duty on wine was £1.56, so we’ve seen an increase of 46% in just 4 years. In the 8 years before that, duty went up 15% in total. 4. Duty is counted as part of the cost price by retailers and merchants, so one would expect to see prices rise by more than the 11p if margins are maintained. 5. Duty on sparkling wine has gone up to £2.43 a bottle plus VAT (£2.92) – £35 a case. Bloody Nora. 6. 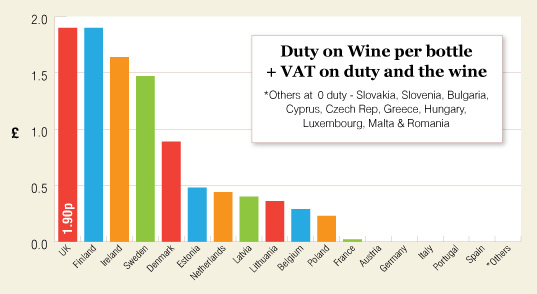 Many Brits have little idea that duty on wine in many EU countries is almost non-existent. The 11p duty rise alone is more than the total duty on a bottle in France, Germany, Spain, Portugal, Italy and Austria put together. Hope you and family are all well. Cheers Mark. Slight delay in replying due to Ange and me being on a flying visit to taste with King Cod down in Padstow. On tight margins, the duty rise makes it tougher to put our prices up on top. It was expected though. Beautifully put, Gavin. Pithy and to the point. Wonderful analysis. Much critical ink is being spilt on this but you sum it up perfectly in two well chosen words: 'Bloody Nora'. I though it was only the South African government that was trying to kill the goose that’s laying golden eggs! Great post, thanks. It’s no wonder quality wine is such a hard sell in this country! An excellent follow up on your previous write up on the subject Gavin. Now that I'm here I want to ask something I've been thinking about a lot lately: are you by any chance aware of the legality -or lack of- of double taxation according to EU rules? It is obvious that HMRC see no problem in pilling VAT on top of duty, but how about EU legislation to that effect? If there isn't one, perhaps we should start a campaign to break this most damaging taxation system that's killing jobs, trade, and prospects for all involved? Thanks for this informative article Gavin. I stumbled upon it when doing some research for my company. Lazenne sells a specialized wine luggage enabling travellers to take 12 bottles of wine on the airplane. This article confirms for me that it's definitely worthwhile to travel to countries such as France, Italy and other EU wine regions and bring back up to 90L of wine as per the EU personal consumption limits.